No Author Samuel Joseph May. Born in Boston, Massachusetts, September 12th, 1797. Died in Syracuse, New York, July 1st, 1871. Syracuse: Syracuse Journal Office, 1871. 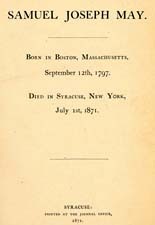 Harvard University Libraries provided the text for the electronic publication of this title.